Walking Through History At Zion National Park A tunnel, carved into a canyon wall, opened up Zion to visitors in the 1920s. An engineering marvel, it became nearly as much of an attraction as the park itself. As part of the park's centennial celebration, the tunnel was opened to nighttime explorers. A hiker takes in a view of rock formations at Utah's Zion National Park that rise more than 3,000 feet above the canyon floor. It never happened before, and it's not likely to happen again. The tickets were snapped up in four hours when they were offered in June. 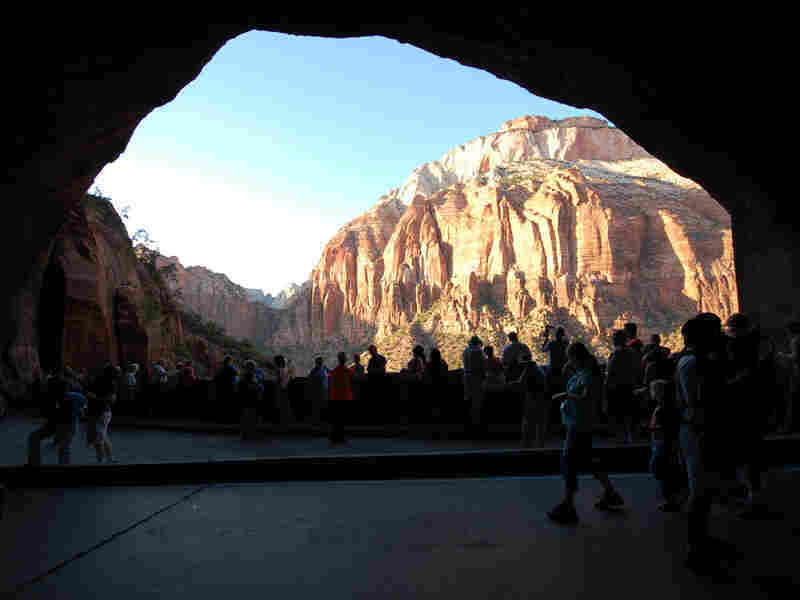 And those lucky few ticket holders traveled from across the West to hike the mile-long tunnel, which was carved out in the late 1920s, 800 feet above the floor of Zion Canyon and 20 feet inside a sandstone cliff. 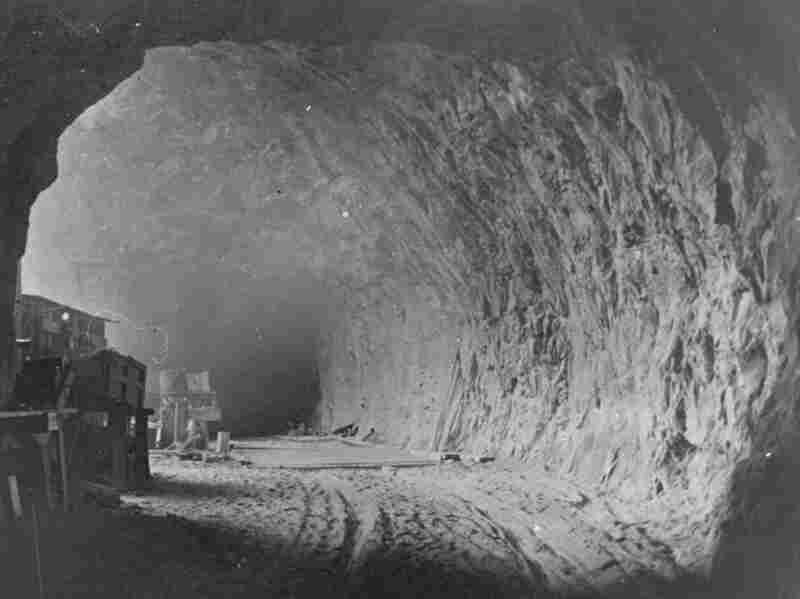 The Zion Tunnel Walk was part of Zion's centennial celebration. It showed how a man-made feature in a national park can become as important as the natural and scenic features the park was established to protect. "The human presence is also part of the recent history of that place," says Louise Excel, a native of Springdale, Utah, a town of 600 just outside the park. "And it's important, too." The tunnel's history — and family connections with that history — drew many of the people holding Tunnel Walk tickets. 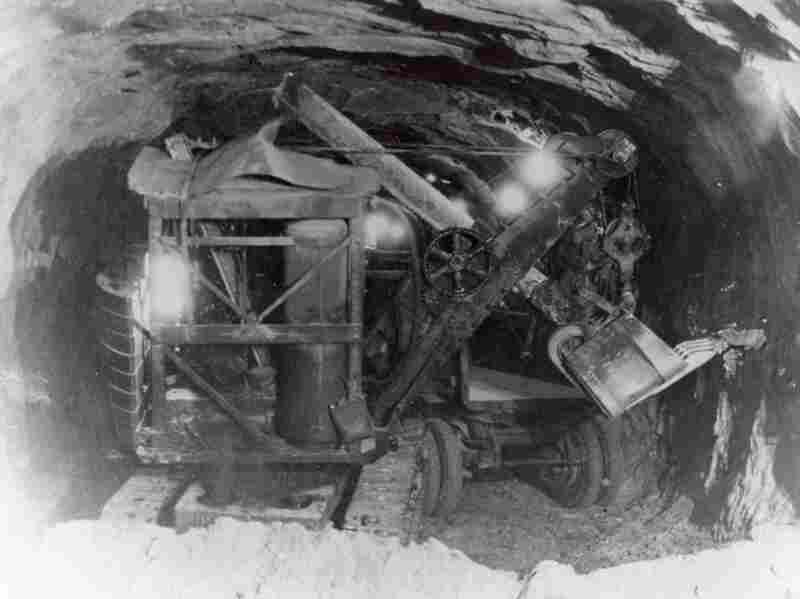 Colton Winder, a 22-year-old college student from Hurricane, Utah, is the great-great grandson of Zion pioneer John Winder, who guided engineers to the place where the tunnel was built. Winder calles the Tunnel Walk a completion of his great-great grandfather's dream. 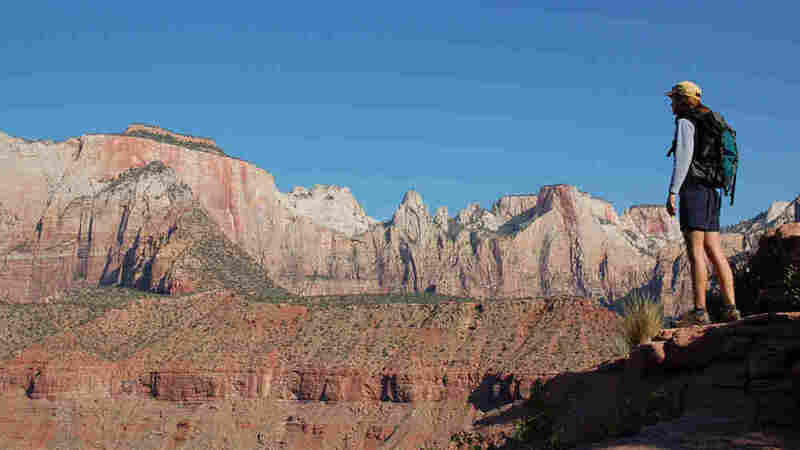 "He was always seeking to unite Zion with the area outside of Zion," Winder says, "to open this area up to the outside world. And this tunnel is what made that possible." 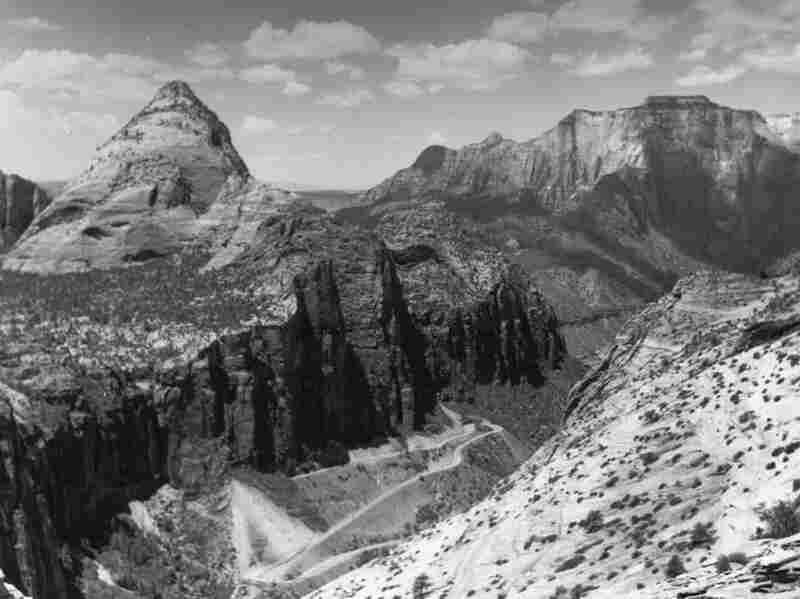 In the 1920s, the relatively new national park at Zion was accessible from the west over rough dirt roads leading from a railroad spur 82 miles away. Still, that journey was quicker and easier than the trek from the east. It took Excel's grandfather a week to get from his home east of the park to his job in Zion. "This was a box canyon," Excel says. "There was one way in and one way out. The original name that the Paiutes gave for this canyon meant 'like an arrow's quiver.' "
Colton Winder's great-great grandfather pioneered some difficult routes east. One involved jumping down from a cliff into the top of a ponderosa pine. Another went up a log, propped up against a steep sandstone face; cleats hammered into the log provided traction. "It would have been tough even for mountain goats," recalls 95-year-old J.L. Crawford, who worked in the tunnel construction camp as a boy. Crawford says the isolated Mormon community that lived in Zion was ready to come out of isolation. "They appreciated the isolation in the beginning, but then as they made peace with the rest of the world, they wanted a little piece of the world," Crawford explains. "They started looking for a means of getting out to markets." 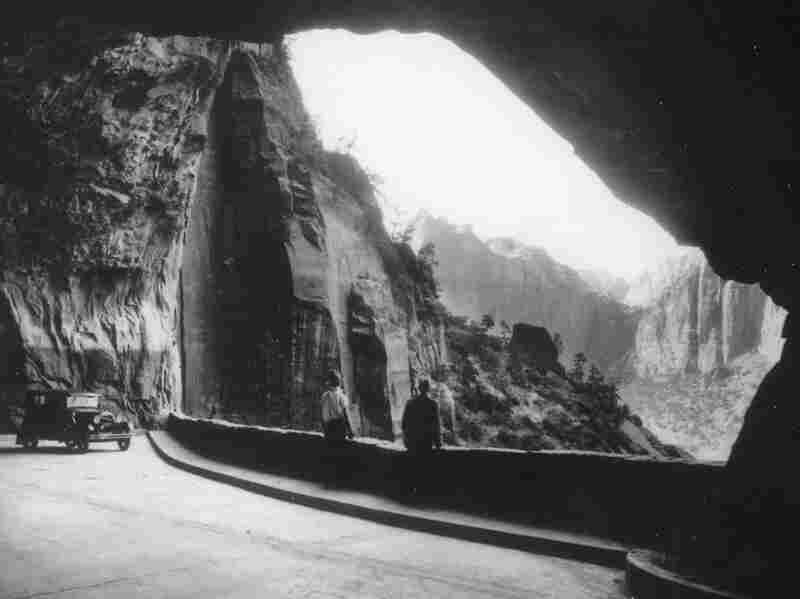 There was also great interest in linking Zion, Bryce Canyon and Grand Canyon national parks; a road across Zion would make excursions to all three easier and quicker. The Union Pacific Railroad was building national park hotels and bringing in tourists on trains and buses. The National Park Service was a new agency anxious to attract visitors. And the new and growing automobile industry wanted to give people better roads and more places to reach by car. 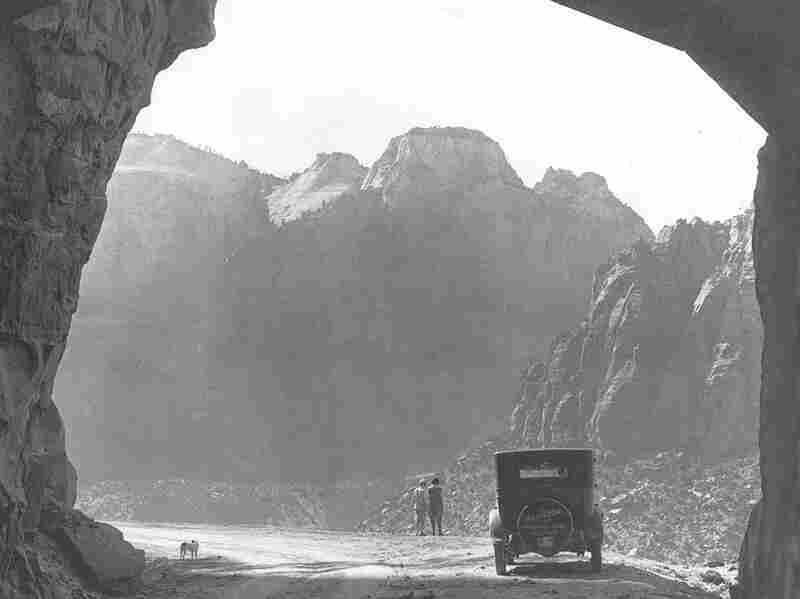 The silent film Rainbow of the Desert: Zion National Park, made by the Park Service in the 1930s, shows the tunnel in its first decade of existence. 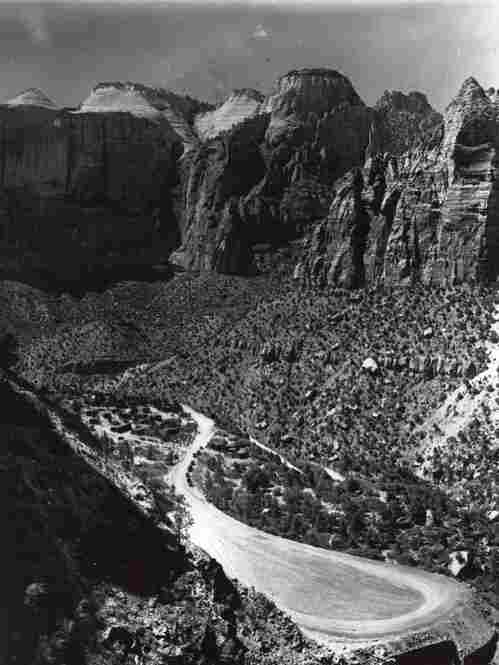 Zion has some of the steepest gorges on the continent, so a road was difficult even to imagine. 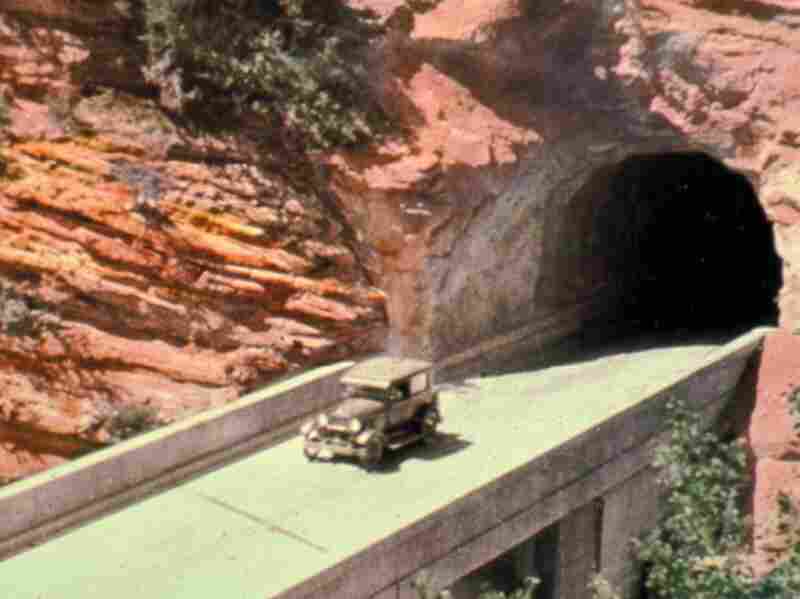 "There had been a number of engineers who came in and tried to figure it out and said that it's impossible," says Donald Garate, a national park historian and author of The Zion Tunnel: From Slickrock to Switchback. "It would bankrupt the national treasury to try to build a road out. So, it was known before they even started extensively looking into it that it was going to be a horrendously expensive venture." 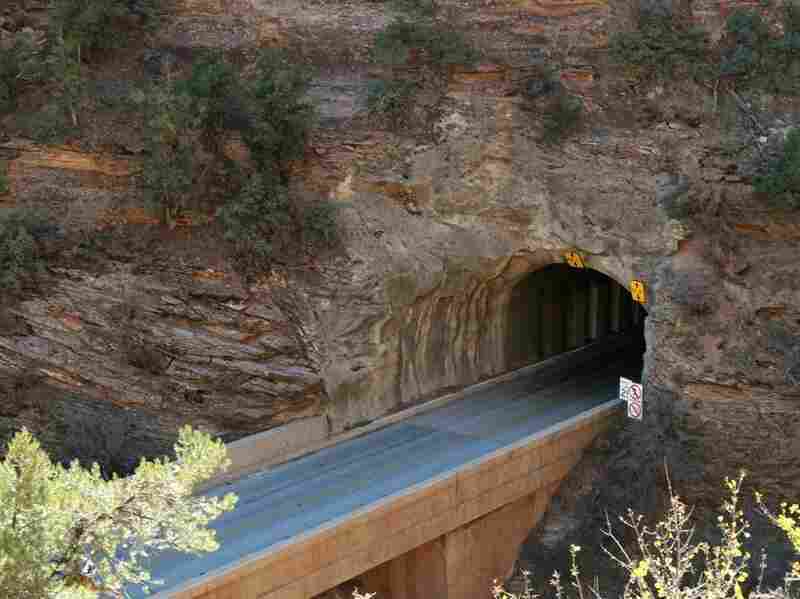 To protect the view, engineers decided to build a snaking, switchback road 800 feet up loose rock and boulders, at the base of a massive sandstone cliff, then tunnel into and along the cliff, about 20 feet inside the face. "Windows" were blasted into the cliff as a way of digging in from the side. The cost — at the dawn of the Depression — was close to $2 million. In the early decades, traffic was light and cars were small, so people stopped at the windows to take in some of Zion's extraordinary views. At one window, visitors gazed across at another canyon wall just 20 feet away, and then looked to the canyon bottom hundreds of feet down. An explosion in visitation brought more and bigger vehicles, including tour buses, RVs and pickups towing boats. 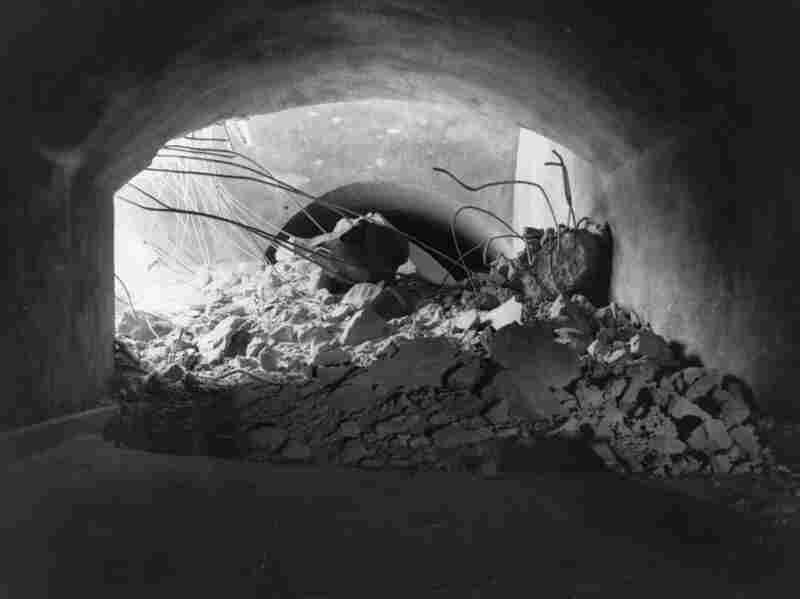 The busy, narrow and winding tunnel became too dangerous for leisurely stops at the windows. At times, rangers were forced to close one lane to traffic to allow larger vehicles through. That was necessary more than 28,000 times last year. 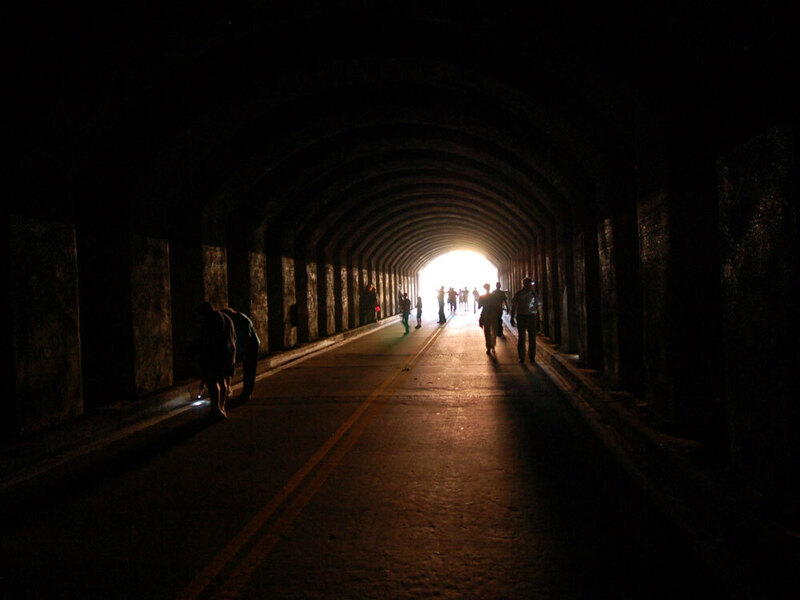 Some summer park workers and local teens defied a ban on pedestrians and raced through the tunnel at night, running their hands along the sides to keep their bearings in the blinding darkness. Some of those participating in Thursday's predawn Tunnel Walk admitted to having made the run in the past while naked — part of a forbidden rite of passage. But it has been decades since visitors could legally walk through the tunnel, recalling family connections to its history as they stopped at the windows for the views. This week's event was designed to let them do so legally, noted Zion Superintendent Jock Whitworth as the Tunnel Walk began. "They were built for that reason, for our pleasure," he said. With headlamps and flashlights lit, the crowd surged into the darkness, testing the acoustics with shouts and even music. Furniture-maker Mike Crawford brought a homemade flute and played Amazing Grace. He says he chose Amazing Grace because of the reverence involved in it. Some of the 300 people who snagged tickets for the first and only park-approved walk through the Zion Tunnel use headlamps and flashlights to light the way. "It's a good spiritual song, and the echoes and sounds that come out of this tunnel and all the canyons in the park are spiritual," he says. "And I think it fit." Painter Roland Lee brought his sketchbook and stopped at every window, trying to draw as much as he could in the 90 minutes reserved for walkers in the tunnel. "This is the first time I've had the chance to actually stop here, look out these windows and look at the vista, you know, from this vantage point, which is different from anywhere else," Lee says as he sketches furiously. "Maybe I'll do some paintings from it." Lyman Hafen of the Zion Natural History Association was one of the guides answering questions and providing historical perspective. But as he stood at one of the windows, he confessed to a mystical sense of wonder. "[It's] how you pass out of this beautiful brightness into a dark hole and then emerge again into what almost feels like a bright, wonderful new world as you come out of it," Lyman explains. "It's almost like being reborn." Tunnel visitors look out one of the vast "windows" in Zion Tunnel. The walkers lingered, but with traffic halted in both directions, rangers urged people toward waiting buses at the west entrance, where construction originally began. The logistical challenge had park officials predicting that they would never do this again. They also said that since the tunnel is so historic, modern costs so great and environmental laws so restrictive, that widening the tunnel or adding a parallel tunnel is impossible. And that's exactly how Louise Excel wants it. "One of the things that makes Zion National Park special, is it forces you to slow down, to relax, to get out of the mode of rushing from place to place," she says. She says that the tunnel, as it was built and as it exists today, helps enforce "the spirit of the place."